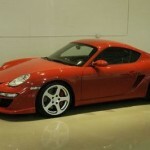 This is a 2007 Ruf produced and titled 3400K Coupe. 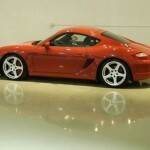 Ruf Automobile GmbH has a unique and exclusive relationship with Porsche. Ruf Automobile purchases a “body-in-white” from Porsche- “body-in-white” refers to the most basic structure or frame of the car with nothing installed including body panels, drive train or suspension components. Ruf then completely “hand-crafts” the vehicle from that point at their factory in Pfaffenhausen, Germany, all paint, engine, interior, suspension and unique Ruf components are fitted. 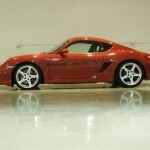 This is why Ruf is recognized as a manufacturer and Ruf cars have their own unique VIN. And here’s a Ruf promotional video, which features a Ruf 3400 about midway through the video, which is set to Firestarter by Prodigy. Awesome! Now that I’m totally smitten with this fantasy car, I’ll be very eager to see what the final bidding reaches. Then I’ll take that number and adjust my keno ticket accordingly! 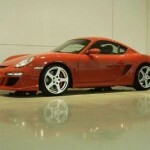 Tagged Cayman, Cayman S, Porsche, Rare, Red, Ruf, Tuner Car.